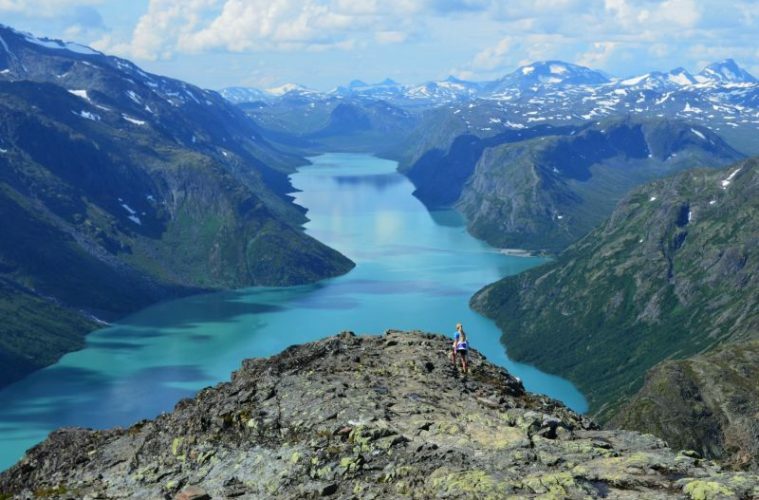 From the breathtaking scenery of the fjords to the remote wilderness of the northern isles, the variety of hiking in Norway has long drawn in serious adventurers from around the world. 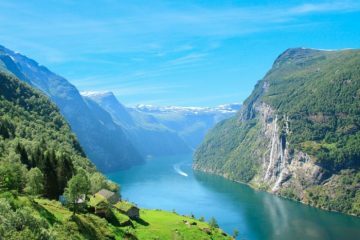 This Scandinavian gem has its fair share of hiking opportunities, all of which you can rest assured will bring unbelievable views and varied terrain to tackle. 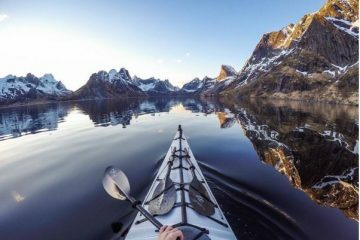 With this in mind, we got together with Norwegian outdoor clothing brand Odlo to find you the top seven most incredible places to go hiking in Norway. 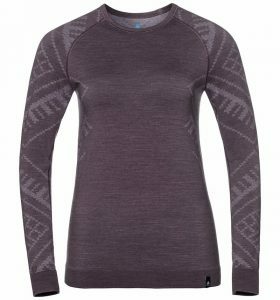 The brand’s new line of Unity Kinship base and mid-layers are the perfect blend of Scandinavian style and performance, with thermals and mid-layers made from natural fibre blends from the finest merino wool to keep you comfortably cosy while hiking. 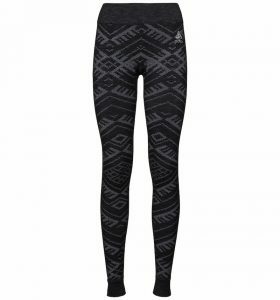 The soft fabric allows excellent freedom of movement and breathability, while the traditional jacquard knit pattern blends Scandinavian tradition with contemporary fashion. 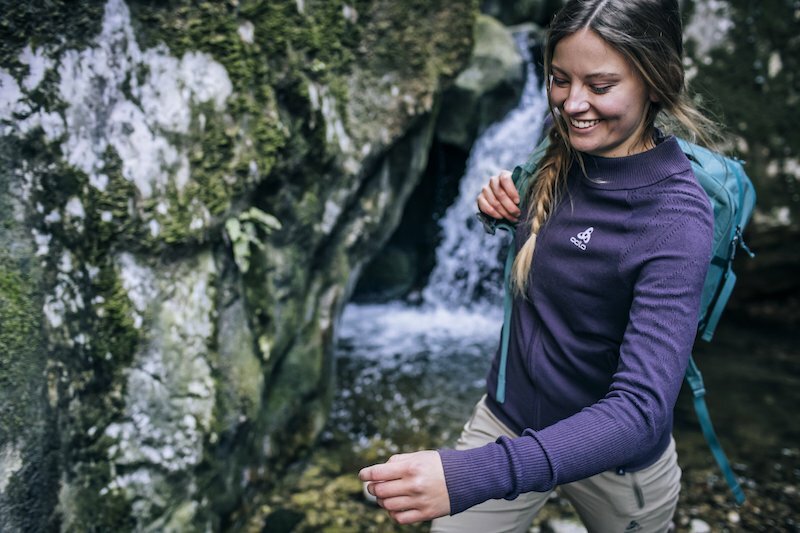 Be prepared for the colder climes on these Norwegian hikes by checking out the full range here or in store at Snow+Rock. 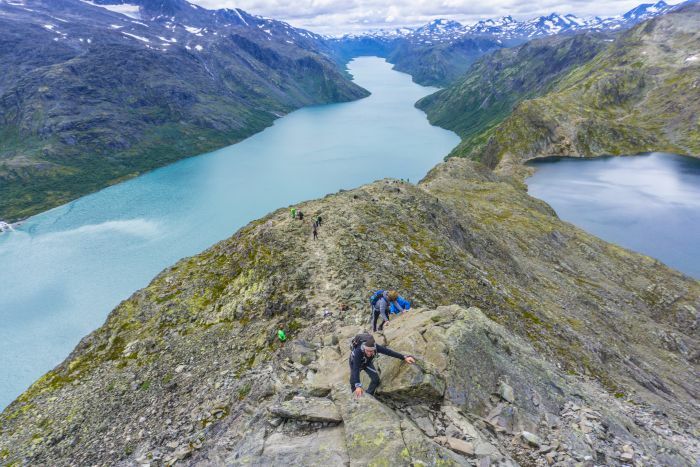 Chances are you’ll have seen pictures of the famous ‘Troll’s Tongue’, the huge slab of rock which juts out into the precipice above Lake Ringedalsvatnet, and which is the primary aim of this challenging hike. You’ll need to have experience and determination to make it to Norway’s answer to Pride Rock, but you’ll sure be thankful when you did. The incredible rock formation makes for the most unbelievable viewpoint, as you balance precariously some 700m above the glistening lake below. 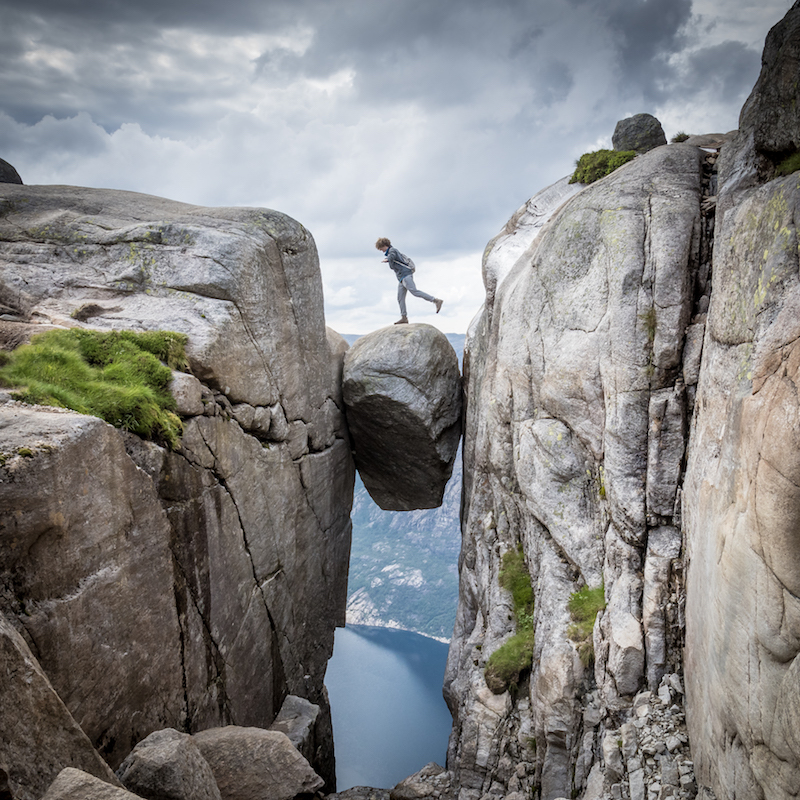 This is another of Norway’s hikes made famous by the hundreds of spectacular photos taken on the recognisable Kjerag boulder, which sits wedged between two cliffs. Many an intrepid adventurer has taken a daring step onto the boulder, suspended hundreds of metres above the river below. Join them by taking on this unusual hike, which features loads more interesting rock formations and excellent views along the way. 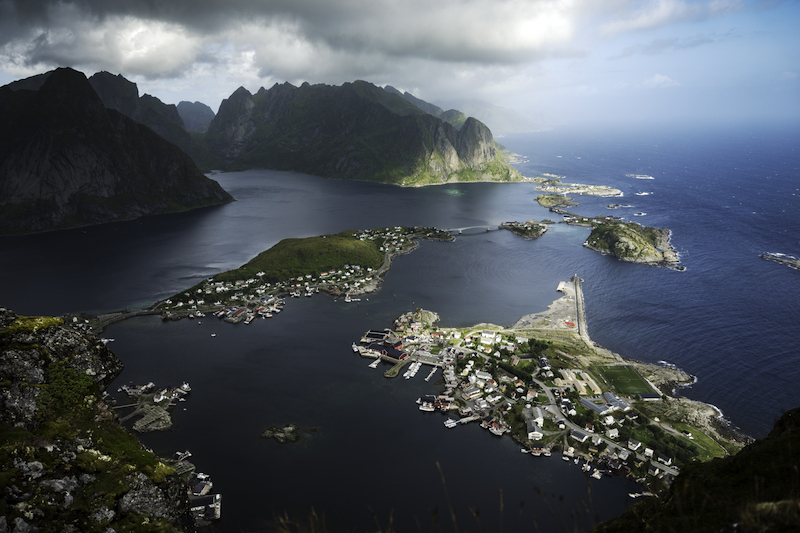 Short yet spectacular, you won’t want to forget your camera for this hike in the strikingly beautiful Lofoten Islands. A recently renovated trail means hiking up the relatively modest Mount Reinebringen (448m) is not as strenuous as other hikes on this list, but it still delivers with its fair share of spectacular views. 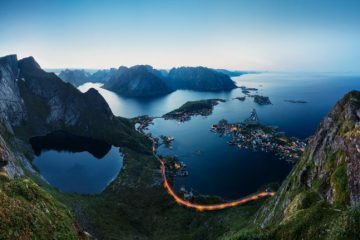 You’ll be treated to vistas over the village of Reine from the top, with the remarkable jagged rock formations rising from the deep blue waters of the Norwegian sea, and smaller islets scattered in between. 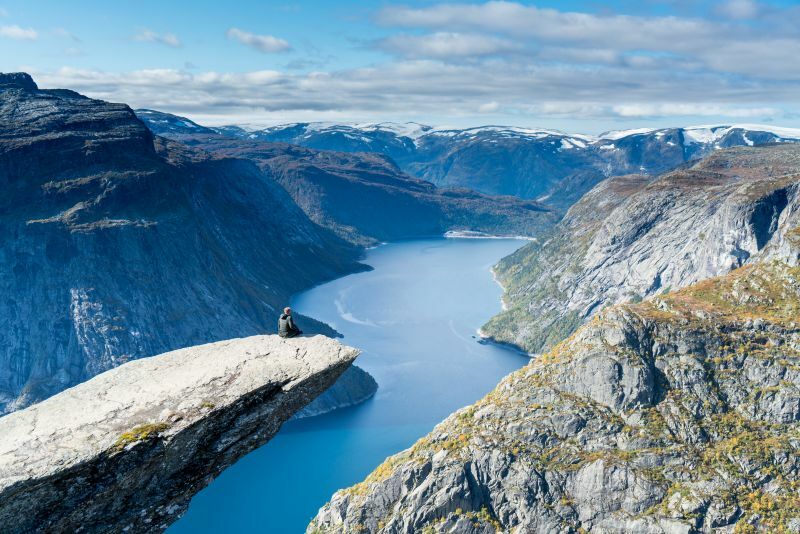 A list of the best hiking in Norway would not be complete without the Besseggen Ridge hike, known to be one of the country’s most popular one-day hikes, with an estimated 30,000 people heading for its jaw-dropping scenery each year. 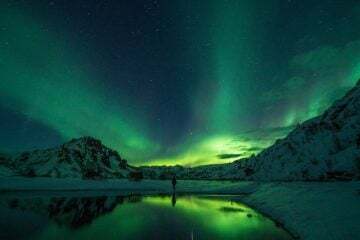 Located in the same region as Norway’s highest point, the ridge walk offers a backdrop of snow-capped mountain scenery as you ascend the spine-chilling ridge, with the vibrant emerald lakes of Gjende and Bessvatn on either side. 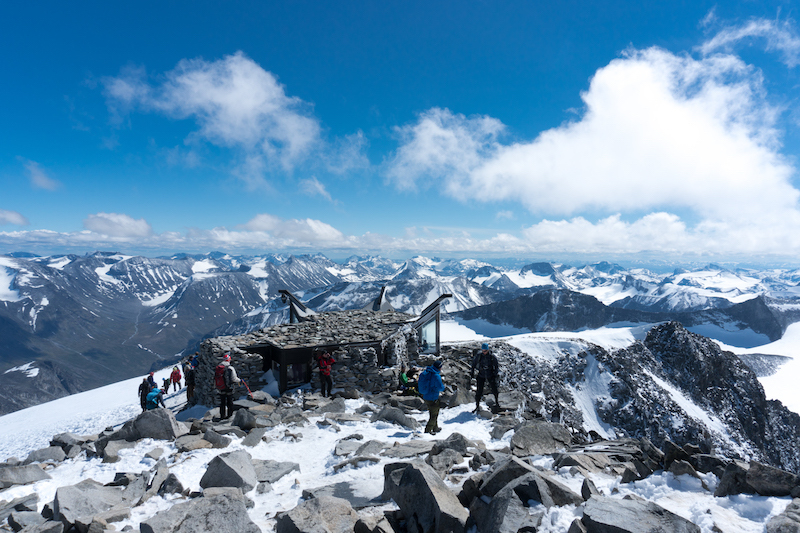 Read our full guide to hiking Besseggen Ridge here. 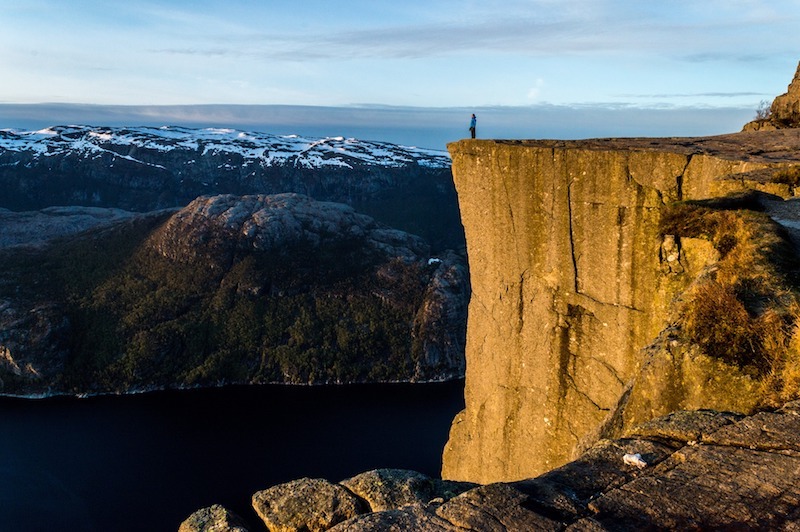 Known as Pulpit Rock in English, this is possibly one of the most well-known views in Norway, with the impressive rock plateau jutting out 604m above the Lysefjord, making for one memorable viewpoint. It’s thought that the rock was formed thousands of years ago by the expansion of ice as it froze in mountain crevices, and there are plenty more interesting viewpoints with glacial rock formations along the trail. 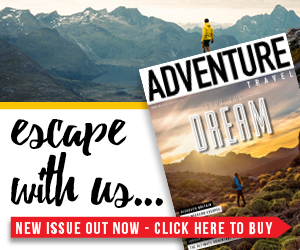 You’ll pass through woodland, over boardwalks and across steep rocky staircases on this popular trail, and it’s advisable to tackle it early in the morning or in the evening if you want to beat the crowds. Calling all wildlife lovers – this one’s for you. 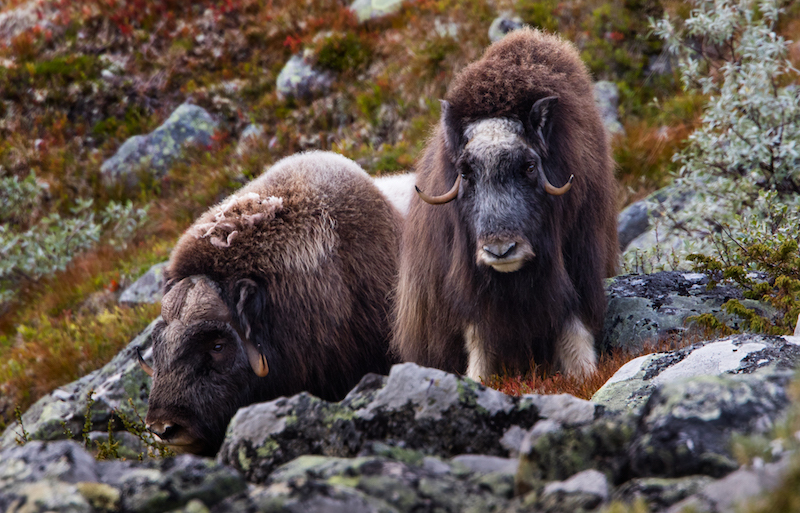 Dovrefjell National Park is believed to be one of the only places you can see musk ox in the wild, and it’s here you’ll find herds of these magnificent creatures roaming against an equally impressive backdrop of rolling Norwegian countryside. Traversing this remote terrain amongst the wild reindeer and oxen with their long shaggy coats will make you feel as though you are a Viking from Nordic times gone by. 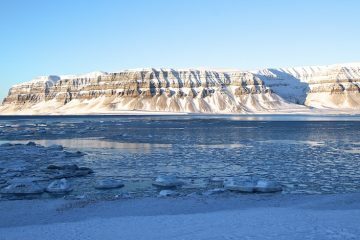 Several circular routes begin from Kongsvold or Grønbakken, ranging from a short two-and-a-half-mile route to a longer nine-mile trek. This one makes for a neat tick off the list, as it happens to be not only the tallest mountain in Norway, but also the tallest of all of Scandinavia and Northern Europe. 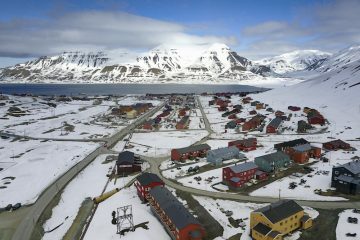 At 2,469m, it’s a challenging ascent from Spiterstulen (1,110m) to the summit, where you’ll be rewarded with rugged, snow-capped peaks and impressive glaciers as far as the eye can see. During summer, the small stone hut located at the top can also reward you with a warm drink and a snack. Hiking in Norway requires a little more technical kit than hiking in our milder climate here in the UK. Changeable weather means that employing the layering principle is your best route forward to ensure you stay warm when the weather turns. 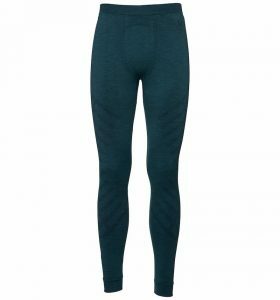 Norwegian brand Odlo was founded in 1946 and has been manufacturing technical underwear since it began developing warm, stretchy high-performance suits for the Norwegian Olympic team at the 1964 winter games. 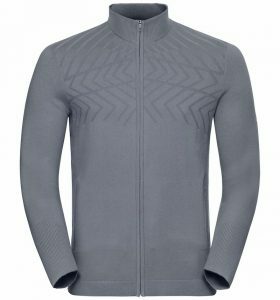 As the inventors of the three-layer principle – the first layer for effective moisture management, the second for temperature regulation and the third as protection from wind and rain – you can be sure that the new line of Odlo Unity Kinship base and mid-layers will perform at their best. They’re the perfect accompaniment for any hiking in Norway (or in the UK, for that matter) you are hoping to tackle.